In the final round of Group C games, the Italians took on the Irish in Poznan with the former looking to progress to the quarter-finals with a win. Having already been eliminated from the tournament last week, Republic of Ireland were playing for nothing but pride tonight. Pride; it was a word which resonated with the entire team, perhaps none more so than Damien Duff who was handed the captain's armband by Robbie Keane to mark his 100th cap. 1. Too little, too late. Despite being considered an outside bet prior to the tournament, ROI's qualities were never in doubt. Manager Giovanni Trapattoni shaped his team into a 4-4-2 making them hard to beat, especially with their industrious back-line and midfield. 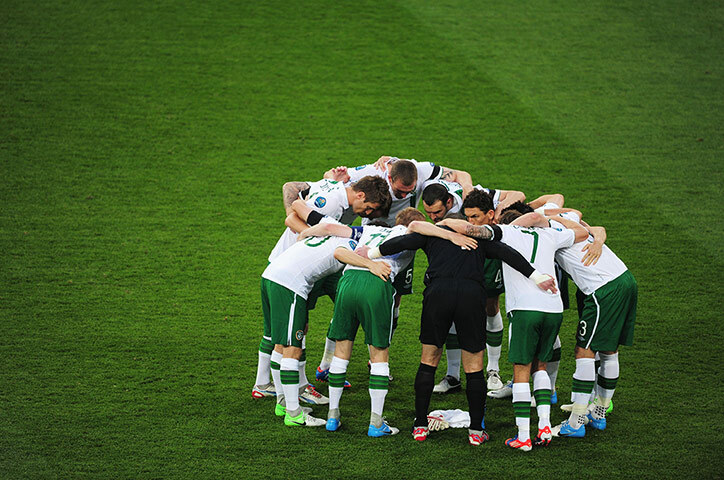 However, in their last two games at the Euros, ROI had conceded goals in the first five minutes of each half. Concentration and positioning brought into question, they needed to make sure there would be no mistakes tonight. Balotelli's goal, Italy's second, painted a misleading picture as this was not the Ireland we had seen in the last two games. There was plenty of grit, passion and work rate in tonight's performance - more so than usual, certainly. Unfortunately for them, it came too late. With Mario Balotelli and Antonio Di Natale showing signs of form, it provides Cesare Prandelli with a welcome selection headache. Both strikers have a goal to their name in this tournament and the manager has spoke of selecting personnel based on their “physical state” and “scientific data”. Unlike Di Natale, Balotelli has failed to get behind the opposition’s defence in recent games and his erratic nature may go against him. Furthermore, fans have had the pleasure of seeing Italy field the 3-5-2 formation in their first two games. Considering the spine of the team plays for Juventus, who also use the tactic, the players have been able to adapt to it without any major problems, as seen by their hard-fought draw in the opening group game against Spain. Tonight against ROI, they lined up in a 4-3-1-2 with Cesare Prandelli replacing the wing-backs for a flat back four. The performance itself was nothing to write home about, however it showed their ability to play two different formations with relative ease which will stand them in good stead for the tournament. Is this the end of the line for ROI’s golden generation? As ROI had no chance to progressing any further in the tournament, critics in some quarters were campaigning for Trapattoni to use the final game to start the transition from the current generation to the next. This, however, was not the case. Facing Italy with nothing to lose would’ve been a great learning curve for talents such as James McClean and Darron Gibson, however Trapattoni, admirably, continued to back the players who had got the proud nation to the finals in the first place. 4. End of an era? Questions regarding the retirement of some of ROI’s more senior players have been posed all week. Given, Dunne, Duff and Keane are all on the wrong side of 30 and there is no clear signal that the group will stick around for the 2014 World Cup in Brazil. Some of the old guard, such as Keith Andrews who, despite tonight’s game, was one of the better performers, may decide to stick around to help usher in a new age for Irish football. The lack of notable Irish talent has been well-documented but one only has to look at James McClean who rose to stardom from relative obscurity in a short amount of time. With France and England likely to confirm their progress to the quarter-finals tomorrow, Italy will fancy their chances against two teams who have not exactly flourished in the campaign. Looking at the other possible contenders, Spain have failed to perform to the level we saw at the 2010 World Cup and Euros in 2008 and Germany/Portugal are on the other side of the draw. Should Italy reach the final, anything can happen. As Chelsea fans well know, all it takes is one good game.